A few weeks ago, law firm Henley & Partners promoted its citizenship-by-investment programmes in the Executive Focus section of the Economist, disguised as a job ad. This week, Athena Advisers – another law firm – advertises its services to join Portugal’s zero-tax regime in the Property section. If it can’t do without such advertising, maybe the Economist should add a Dubious Legal Services section, so that the offers are at least under the right heading. This week’s ad leaves really no room for doubt. You would expect that a property broker uses a slogan like “Lisbon – Europe’s most beautiful city”. 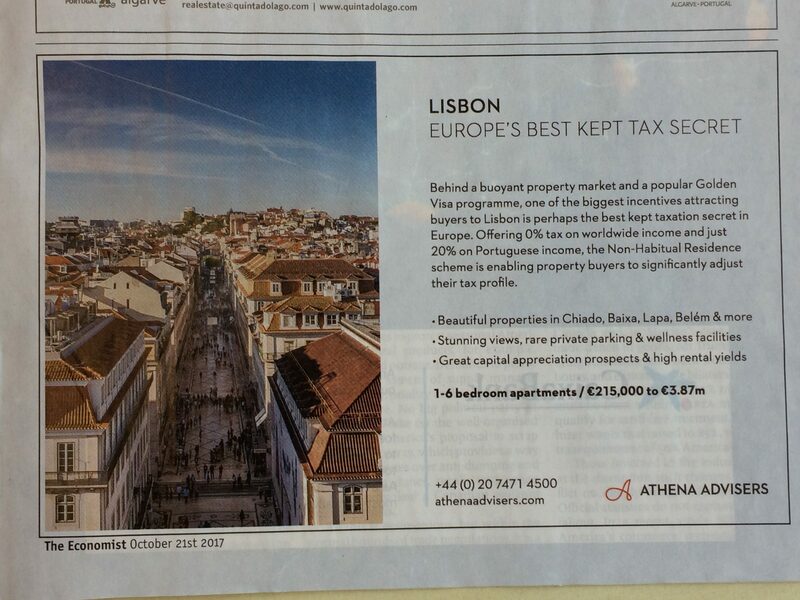 Instead, Athena entices readers with “Lisbon – Europe’s best kept tax secret”. They do mention “beautiful properties” and “stunning views” too, but clearly the tax advantages come first. They are a secret no longer. But wait a minute. This is about Portugal, not a notorious offshore destination like Malta or Antigua and Barbuda, with their bright beaches and shady services. Isn’t Portugal a high tax country? Well yes, it is, for the Portuguese. On personal income above 80 thousand euro, they pay 48% tax. Plus 3% surtax. Plus an additional solidarity charge of up to 5%. That is a lot, but these rates only apply to the well off. As The Economist reports, just three pages after the Property section, such progressive taxes tend to reduce inequality without hurting growth. Much less solidarity is expected from wealthy foreigners, though. Portugal’s Non-Habitual Residence scheme offers a flat 20% rate on income from employment. Moreover, on foreign income, including interest, royalties, and pensions, the rate is 0%. Those are costly measures to generate a bit of fee income and boost the high end of Lisbon’s property market. Costly to other countries, that is. The government does not allow its own rich citizens to join the scheme, the tax breaks are only for people that have not been Portuguese residents during the previous five years. 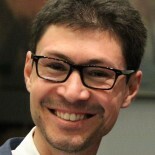 Non-Habitual Residence is promoted online in French and Russian. It’s not for all French pensioners and Russian billionaires, though. In contrast to many offshore destinations, the scheme requires foreigners to physically move to Portugal. To become a Non-Habitual Resident, they first have to live in the country for at least 183 days in one year. That’s quite a hurdle, you won’t qualify for the scheme by merely buying a property and spending a few weeks of holidays there. Yet after that hurdle comes the tax secret: you become entitled to pay tax in Portugal for 10 years. Nowhere it says that you have to continue living there. The 10-year residence certificate is issued in advance on purpose. Athena’s ad hints what to do after enjoying Lisbon’s “stunning views” for 183 days: the properties also generate “high rental yields”. It all sounds a bit unfair for Portuguese millionaires. By setting up such an outrageous scheme, their government sends a signal that it’s OK for them to do the same and become residents of a Caribbean island, or perhaps Jersey or Malta. That’s what you get if solidarity stops at the border. This madness must end.